Swansea City: Gueret, Ricketts, Austin, Iriekpen, Monk, Forbes, Britton, Gurney, Robinson, Connor, Trundle. Subs not used: Murphy, Tate, Maylett, Anderson, Pritchard. Chester City: MacKenzie, Davies, Bolland, Bayliss, Elokobi, Vaughan, Harris, M.Brown (Hessey 59), Hillier (O’Neill 68), Walsh (Lynch 88), Branch. Subs not used: Hope, W.Brown. As we bade our farewells to the Vetch Field after a comprehensive 3-0 defeat at the hands of an organised Swansea City, I wondered if we’d get to seem them take on the Blues at their splendid new ground next season. 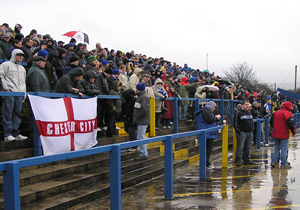 I actually have a feeling we won’t be at White Rock Stadium in 2005/6 – but because Swansea seemed destined for promotion, while Chester left me feeling distinctly nervy about their prospects of League Two security. The first 40 minutes of the game were relatively encouraging, if not exactly exciting, for the 102 brave Blues fans spread out in their half of the West Terrace. Chester were able to hold their own against a well-marshalled Swansea side cheered on by a near 8,900-strong ‘Jack Army’. Ian Rush started Michael Branch as the lone striker – either because he had no other option or he wanted to go for a defensive formation. Either way, it was never going to be easy for Chester with midfielder Stuart Drummond and suspended captain Stewart Drummond sitting in the stand watching the match. 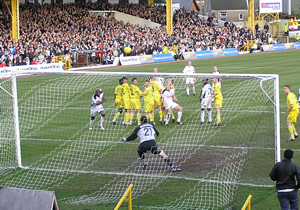 Swansea had a chance in the first minute or so, but goalkeeper Chris MacKenzie was easily able to hold the shot – the first of many saves he had to make during the afternoon. He sprang into action not long after, making an excellent reflex save from Lee Trundle. Chester managed to keep the Jacks quiet for much of the rest of the second half. Blues’ loan-signing George Elokobi (“Big George” as he was dubbed), made a confident start to the game. It can’t have been easy for a teenager making his debut in Saturday’s hostile atmosphere, but he didn’t put a foot wrong in the first half. Swansea became more threatening as the half drew to a close, with Stephen Vaughan being called on to clear the ball off the line from an Adrian Forbes header. The tone of the match changed with just three minutes of the first half remaining when the referee blew for an infringement on the edge of the box. 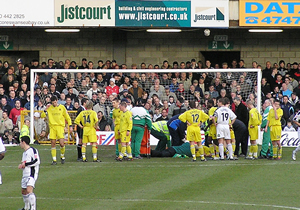 It wasn’t clear why he’d given the free kick and initially it looked like he’d waved play on. But when Lee Trundle lined the ball up, his strike was only going one way. 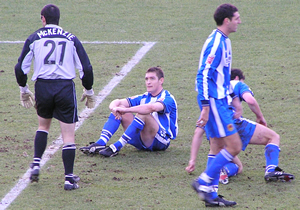 He took a perfect kick which went over the Chester wall, past the diving MacKenzie, and into the top right-hand corner. There was no way the Blues, who were actually playing in yellow, could come back before half-time and it was a shame the Chester team weren’t watching the half-time penalty shoot out. 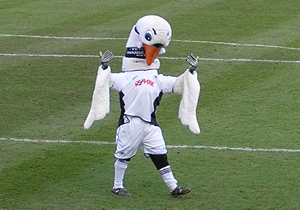 They might have taken some inspiration from the enthusiastic little kid who ran the full length of the pitch, then all the way back again, to thwack his penalty past the Cyril the Swan mascot. It resulted in just about the only cheer of the day given by the away fans! Both sides ran out for the second half without making any changes, and Michael Branch set up Andy Harris in the first few minutes. But Harris’s shot sailed well high of the crossbar. Swansea also had their early chances, with Trundle laying on Andy Robinson. His shot was parried for a corner by the busy MacKenzie. Chester failed to clear the corner and Trundle look-a-like Paul Connor had no trouble finding the net from close range. Just when it looked like it couldn’t get any worse for Chester, Michael Brown seemed to get trapped in Chester’s box between a sandwich of players. He obviously received a bad injury as play was stopped for five minutes before he was stretchered off. Brown was replaced by Sean Hessey, but Chester were now well on the back foot and showed no sign of doing anything other than conceding a goal. They had simply run out of ideas and with the number of loan and youth team players on the park it was no wonder they didn’t really play as a team. So it was no surprise when goal three came. Trundle struck from about 20 yards out and MacKenzie appeared to think it was going wide. But the ball flew into the net and it was definitely game over. However, soon after MacKenzie made some amends. First pushing the ball away from one side of the goal, then diving across to the other to save yet another good attempt. He may have let in three goals, but he was undoubtedly Chester’s man-of-the-match. 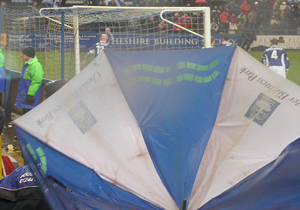 The faithful Chester fans had one hope of a consolation goal when the Blues won a corner in the dying minutes. But it was a weak effort and was easily headed away by the unruffled Swans’ defence. It was far from a happy ‘cheerio’ to the Vetch and I don’t think we'll be saying ‘croeso’ to the White Rock next season. Swansea and Yeovil are easiest the best League Two sides I’ve seen this season and I’m sure they’ll do well in League One. Now Chester have to concentrate on League Two survival. Booked: Drummond, Branch. Sent-off: Carden, Belle. Chester City: MacKenzie, Davies, Bolland, Bayliss, Hope, Vaughan (Hessey 76), Drummond, Carden, M.Brown, Branch, Rapley (Belle 46). Subs not used: W.Brown, Harris, Walsh. Rochdale: Gilks, Evans, Heald, Griffiths, Goodall, Jones, Warner, Cooksey (Clarke 82), Bertos, Tait, Atieno (McGivern 87). Subs not used: Woodhall, Burgess, Gallimore. City will be pleased to gain a point, and another clean sheet, after playing out the latter stages of the game with just nine men. 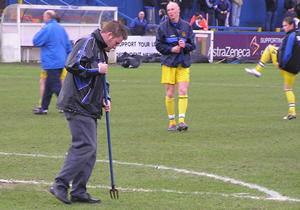 Both Paul Carden and Cortez Belle saw red in a fiery match at Deva Stadium that saw few chances. With the flu bug a distant problem City made two changes form the side that started at Cambridge last week. Phil Bolland returned to the heart of the defence while Kevin Rapley came in for Robbie Booth up front. It was Dale who started brightest with Chris MacKenzie deflecting a Tai Atieno shot into the side netting within the first minute, MacKenzie was on hand moments later to field the ball after a header from the same striker, playing his last game on loan before a return to Walsall. The Blues were being pinned back for the opening period and it was ten minutes before Stephen Vaughan had their first effort, trying his luck with a 30-yard shot that drifted wide. Minutes later it was Stewart Drummond’s turn to see a long range effort comfortably saved my Matthew Gilks in the Dale goal. Efforts at both ends were being restricted to long range with Dale’s Gary Jones next to try his luck to no avail. Five minutes before the break Bolland was well placed to head over from a Stephen Vaughan corner, but it was Atieno at the other end who looked likely to open the scoring when put through on goal, however a great block tackle, six yards out, by Ben Davies saved the day. MacKenzie was called into action moments later as he made another great save to deny the lively Leo Bertos after the striker had shaken off Drummond to force a save from fifteen yards. Ian Rush made a change at half-time bringing on Cortez Belle for the ineffective Kevin Rapley up front. 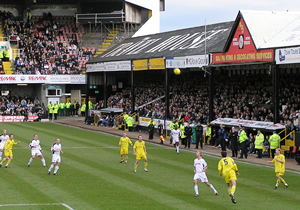 Michael Branch shot wide shortly after the restart before Dale picked up where they’d left off, ex-Bristol Rovers striker Paul Tait testing MacKenzie who parried the ball clear. MacKenzie saved from Greg Heald before City were reduced to ten men as skipper Carden was given his marching orders after words were exchanged with a linesman following a late challenge on the City midfielder. On a rare foray up front Gilks was well placed to save from Davies, and Belle should have done better when set-up by Branch. The Blues were reduced to nine men on 83 minutes as Belle was given his third red card of the season after being adjudged to have used his elbow in a challenge with Gareth Griffiths. Branch found time to shoot high and wide from 18 yards when he raced through on goal with City’s last chance and Bertos did likewise for Dale before referee Wright brought an end to the game. City dropped to 20th position following this point. With just one victory from the last 13 league games they can thank continued poor form from both Kidderminster Harriers and Cambridge United that gives them breathing space above the drop zone. Cambridge United: Ruddy, Gleeson, Duncan, Rea, Bimson,Tudor (Easter 72), Walker, Quinton, Wardley (Tann 59), Webb (Chillingworth 64), Turner. Subs not used: Goodhind, Konte. Chester City: MacKenzie, Davies, Bayliss, Hope, Hessey (Walsh 56), Drummond, Carden, Vaughan, M.Brown, Booth (Belle 45), Branch. Subs not used: W.Brown, Harris, Rapley. Given the circumstances leading up to the match, manager Ian Rush will no doubt be delighted to come away from the Abbey Stadium with a point and a first league clean-sheet for 12 games. On Friday Chester had asked the Football League for a postponement after all but three of the first team were struck down with a flu bug last week, this wasn’t sanctioned and City were forced to field a half-fit side that hadn’t trained for days. Michael Branch returned from suspension, Robbie Booth came in for the departed Kevin Ellison. Richard Hope also returned to the starting line-up. 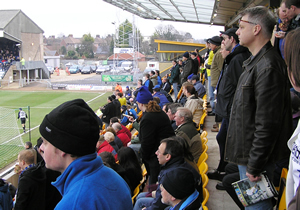 Precisely 260 City fans made the journey and were housed in the smart new south stand that afforded a great view over the proceedings. 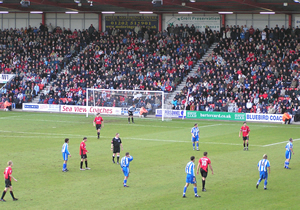 The home side, with just three league wins to their name all season, started well and had the first of the early exchanges. Hope was on hand to clear a second minute corner before the action turned to the other end with Branch first seeing a shot saved by John Ruddy in the Cambridge goal, and then shooting wide when well placed in the box. Chris MacKenzie was called in to make the first of a series of good saves as he caught Stuart Wardley’s shot from the edge of the box following a swiftly taken corner. The home side continued to pile on the pressure, Webb and Tudor went close but the best chance fell to Walker who ghosted through a static City defence to meet an inch perfect cross but he could only shoot straight at MacKenzie from six yards as the chance went begging. The shot-stopper was in the right place again to save from Gleeson. City were very much on the back foot during this period, on a rare breakaway Stewart Drummond saw a shot blocked and Stephen Vaughan sent in a couple of corners with no effect as the half ended goalless. Rush rang the changes at half time bringing on Cortez Belle at the expense of Robbie Booth to partner Branch up front as the rain fell. Belle was soon in the action heading down to set up Branch who shot tamely wide from 18 yards. At the other end United forced a flurry of corners and Tudor saw a snap-shot saved by MacKenzie and Wardley shot high and wide as the home side looked to continue their good approach work of the first half. Ben Davies was well placed on the line to clear a sliced clearance from Hessey following another corner. Ten minutes into the second period Mike Walsh replaced Hessey who looked far from fit. City began to get more into the game as it wore on. Michael Brown saw an effort cleared off the line by Bimson and later found himself in a great position on the corner of the box, he had time to turn and move in on goal but elected to chip with Ruddy catching the ball under the bar. Minutes later Ben Davies, again playing at right back, volleyed wide as Chester enjoyed their best spell of the game. Carden and Brown again tested Ruddy with shots, and in their best move of the half Branch cut in the box form the right, beat two defenders to take the ball to the bye line but his pull-back eluded two onrushing City players and was cleared. As the fourth official indicated four minutes of added time Brown cut into the box on the left and appeared to be nudged over by Duncan but the referee inexplicably awarded a free-kick to the U’s and to add insult to injury booked Brown for diving. AFC Bournemouth: Moss, Young, Cummings (Purches 56), Broadhurst, Maher, O’Connor (Holmes 90), Browning, Spicer, Elliott, Connell (Hayter 68), Fletcher. Subs not used: Stewart, Rodrigues. Chester City: MacKenzie, Vaughan (Booth 85), Bolland, Bayliss, Hessey (Walsh 77), Drummond, Carden, M.Brown, Davies, Ellison, Rapley (Belle 66). Subs not used: W.Brown, Hope. City will count themselves unlucky to come away from Dean Court with nothing to show for this valiant cup effort against League One opposition. 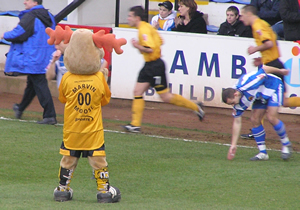 Chester took the game to their opponents from the off, dominated for long periods throughout and, with more composure in front of goal, would have been in the fourth round draw. Injuries and suspensions forced manager Ian Rush to shuffle the team. Ben Davies played at right back and Stephen Vaughan looked more comfortable in his midfield role. Up front Kevin Rapley replaced the suspended Michael Branch while on the bench there was a first appearance for youth player Mike Walsh. Michael Brown found himself with an opening in the first minute only to see his effort charged down by Karl Broadhurst for a corner. Vaughan’s resulting flag kick was comfortable dealt with by Neil Moss in the home goal. Minutes later Kevin Ellison was put through on the left but he elected to shoot early and launched his effort high and wide from 30 yards. Gareth O’Connor shot wide of goal, and Steve Fletcher headed over from six yards for the Cherries but it was City who were carving out the chances during a lively opening 30 minutes. Paul Carden shot over when very well placed, Stewart Drummond headed wide and Kevin Rapley wasted a great chance to open the scoring blasting his shot and wide after being sent through by Hessey. City were made to pay for their missed opportunities as Bournemouth took the lead just after the half hour. O’Conner broke down the right and crossed, despite the close attentions of four defenders the ball broke invitingly to Shaun Maher on the back post who scored with ease. Brown saw a long range effort caught under the bar by Moss before City trooped off to a great reception from their noisy band of travelling fans. Two minutes after the restart City faced an uphill struggle as a mistake gifted Bournemouth their second. A harmless looking left-wing cross was met with no challenge by Chris MacKenzie, the ball slipped right through the keepers hands and dropped for Wade Elliott to slot home the easiest of chances. Cortez Belle came on for Rapley as Chester refused to lie down and continued their push for a goal. They got their reward with 20 minutes remaining as Kevin Ellison, in yards of space, coolly converted Belle’s pass from 10 yards. Drummond headed wide before City introduced two more subs. Youngster Walsh replaced Hessey and Booth came on for Vaughan as time ran out. City’s nearest chance came as ‘keeper Moss made a hash of a Walsh 20-yarder, the ball slipping through his hands, under his body and agonisingly a foot wide of the upright. Chester City: MacKenzie, Hillier (Harris 82), Bayliss, Bolland, Hessey (Vaughan 76), Drummond, M.Brown, Carden, Ellison, Branch (Whalley 89), Belle. Subs not used: Davies, Booth. Lincoln City: Marriott, McCombe, Morgan, Futcher, Bloomer, Butcher, Toner, Sandwith, Westcarr (Yeo 62), Taylor-Fletcher, Green. Subs not used: Carruthers, Hanlon, Blackwood, Richardson. Referee: T. Parkes (W Midlands). It was a case of after the Lord Mayor’s Show for City, who, after encouraging battling displays against Scunthorpe United, Rochdale and Macclesfield Town over the festive period, were brought back down to earth with this injury-time defeat. City will feel hard done by at losing all three points but they scarcely did enough to warrant a maximum return themselves. The game proved to be a dour affair with both sides canceling each other out. Once again manager Ian Rush picked an unchanged side from the one victorious at Moss Rose two days earlier. Kicking towards the home end in the first half it was City who had the early chances, Cortez Belle only half hitting a snap-shot that trickled through to Alan Marriott in the Imps goal. 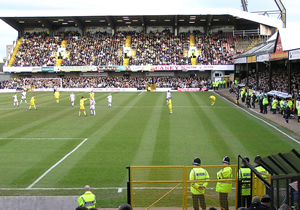 The visitors responded and Gary Taylor-Fletcher twice tried his luck from long range, shooting first high and then wide of Chris MacKenzie’s goal. Belle was put through on goal again but, instead of shooting from ten yards, elected to square the ball to Michael Branch on the right whose cross back was cleared. Branch was on hand again minutes later only to see his shot charged down by Paul Morgan following an outswinging Kevin Ellison corner. The game was stop start through the first period, not helped by a whistle-happy referee Parkes. City’s best chances tended to come from corners with midfielder Michael Brown just failing to connect properly from one as the ball fell to him 18 yards out. Minutes before the break Stewart Drummond almost broke the deadlock. Ben Futcher cleared a Sean Hessey cross for a corner. Drummond met Ellison’s flag-kick at the back post but steered his header over the bar from six yards. The game continued much in the same vein after the break. Taylor-Fletcher saw a fine shot well saved by MacKenzie who managed to push the ball out for a corner and save well under pressure from the resulting kick. At the other end Belle tried his luck rom 25 yards but Marriott saved comfortable. Kevin Ellison proved the dangerman for City as the game wore on. The midfielder, who had an 11 game loan spell at Sincil Bank last season, seemed determined to add to his ten goal tally. Twice he tested Marriott from long range and on two occasions put in dangerous crosses for the towering Futcher to clear. Rush was forced into a change with Stephen Vaughan replacing Hessey who had received treatment for several minutes off the pitch and, minutes later, Ian Hillier who had another good game at the back, was replaced by Andy Harris. Francis Green saw a shot well saved by Mackenzie, the keeper relieved to see the follow-up blaster over the bar. Substitute Simon Yeo was looking dangerous for the visitors, he saw two shots just miss the goal. 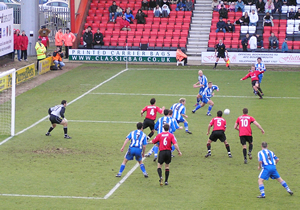 As the game entered the last minute Vaughan cleared well at the back post as Lincoln pressed for a winner. Two minutes into overtime it came. Francis Green played Yeo in on the right who outsmarted Harris and shot high over MacKenzie from a narrow angle to wrap up the points. Macclesfield Town: Wilson, Carragher (Briscoe 90), Welch, Navarro, Harsley, Potter, Whitaker, Strong, Parkin, Tipton, Sheron (Miles 79). Subs not used: Fettis, Widdrington, Teague. Chester City: MacKenzie, Hillier, Bolland, Bayliss, Hessey, Drummond, M.Brown (Davies 70), Carden, Ellison, Belle, Branch. Subs not used: Vaughan, Rapley, W.Brown, Harris. You’ll have to go a long way to see two better strikes to win a game for City than those from Stewart Drummond and Kevin Ellison. Two long-range efforts in four second half minutes transformed the game that Chester had dominated for long periods after the break and sent the 1,000 saturated City fans home with a Cheshire double. Manager Ian Rush kept faith with the side that fought back for a point a Spotland on Tuesday as his side took to the field, as on our last appearance at Moss Rose, in torrential rain. Unsurprisingly, given the conditions, the game got off to a scrappy start, on-loan Michael Brown clearing a second minute corner as the home side, attacking with a swirling wind behind them, pressed for an early advantage. City’s first effort came courtesy of a Drummond shot that flew high and wide before The Silkmen took the lead on 18 minutes. 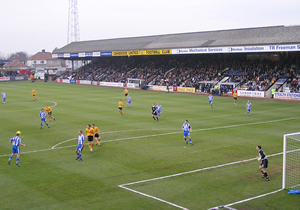 Matthew Tipton’s right wing corner found its way to the edge of the box, a Macc player attempted a shot that skewed wide only to be picked up by Mike Sheron (who had a summer trial with Chester). Back to goal Sheron turned his marker Hillier and shot low past MacKenzie from close range. City responded quickly, Cortez Belle saw a shot blocked by ex-on-loan player Alan Navarro who did we to deflect it for a corner. Paul Carden’s flag kick was easily dealt with by Wilson in front of the large travelling support. City forced another corner minutes later and this time striker Jonathan Parkin was on hand to clear the Macc lines. City were playing well in patches and Ellison was set through clear on goal following one superb move involving a Branch flick-on, but defender Paul Harsley was on hand to make a superb last ditch challenge. 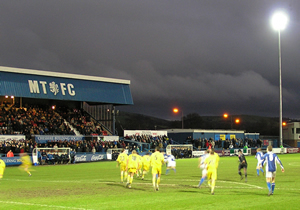 Hillier tried his luck from long range and the Blues forced three more corners in succession before Premiership referee Uriah Rennie brought the half to a close and with it the chance to nip round the back of the Silkman terrace away from the driving rain. MacKenzie was called into action not long after the restart, caught off his line, the ‘keeper managed to get back in time to tip over dangerman Parkin’s shot after he had once again been spotted too far off his line. The resulting corner was cleared. Drummond headed over from six yards following a Carden corner before the home side thought they’d doubled their lead soon after but Whittaker was adjudged offside as he turned in the rebound after MacKenzie had parried a shot from Tipton. Brown missed a glorious chance to equalise soon after as he headed over at the back post after a teasing Ellison cross had eluded Belle in the middle. Brown, who had a busy game in midfield, was replaced by Ben Davies moments later. City continued to press, they had plenty of the possession and forced several corners but never really tested Wilson with any shots of note. However, with thirteen minutes remaining City got the equaliser their second half play deserved. Belle, pushing forward down the right played the ball into Drummond who, with defenders backing off, took it goalwards before unleashing a shot right across the face of goal and into the net leaving Wilson stranded. 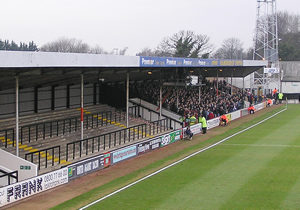 Graham Potter almost restored the home lead as he slammed a curling free-kick against the City bar with the ball rebounding to safety. With just nine minutes remaining an outswinging corner on the right from Carden was drifting out of the penalty area, Ellison chased the ball out, turned, and unleashed a trademark 25-yarder that flew through the area into the opposite corner. A great goal to win any game. The home side responded well and it took a wonderful save from MacKenzie to preserve the lead. City conceded a free-kick on the left edge of their penalty area. The ball was floated over the wall to two unmarked home players, it flicked the head of one and MacKenzie tipped the ball onto the underside of the bar and out to safety. After securing their first League Two victory in ten matches City remain in 19th place.